Google announced on the webmaster blog they made two updates this morning to Google Webmaster Tools. Both are fairly obvious changes around notifying webmasters about blocked resources preventing Google from properly crawling your web site in full. 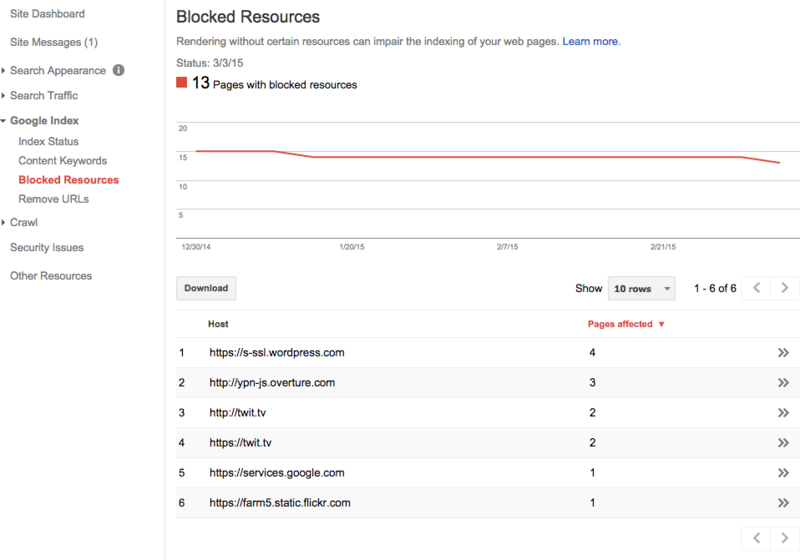 Google also said this report was updated to show how these blocked resources matter. The report landing page shows a list of hosts that provide resources on your site that are blocked by robots.txt rules. Some resources will be hosted on on your own site, and some will be hosted on other sites. Click on any host in the table to see a list of blocked resources from that host, with a count of pages on your site affected by each blocked resource. Click on any blocked resource in the table for a list of your pages that load the resource. Click on any page in the table hosting a blocked resource for instructions on how to unblock that resource, or else follow the instructions below under How to unblock your resources. Terence Mace was the first I know to spot the new fetch & render report, he posted about it on Twitter. Forum discussion at Twitter & Google+.